Most things we purchase these days are stuck with small labels saying, "Made in China." In 2009, China finally stepped into first place as the world's top exporter. Taking advantage of its massive population, China continues to shoulder its way forward in the world, despite its long and much-criticized list of human rights abuses. In 2009, China became the world's largest market for automobiles as well as the world's biggest producer of steel. It isn't a major surprise that this country of 1.3 billion pushed past Germany in 2009 as the world's most successful exporter. Despite China's vast growth, this feat may not have been accomplished in a strong economy; Germany has simply faired worse during the recession than China. Germany's exports fell rather steeply to an estimated $1.17 trillion in 2009, while China's exports fell only 16 percent to $1.2 trillion. Still, that's the point. Taking advantage of its massive, cheap work force, China continues to push its way forward, and analysts expect China's economy to surpass Japan's as early as this year. "Eventually, though I don't expect this for another 20 years or so, the [Chinese] economy will be bigger than that of the United States," said Arthur Kroeber, managing director of Dragonomics, an economic research firm in Beijing. "People are just going to have to get used to these facts - and to remember that most of these facts are simply reflections of China's enormous population, and do not in any way indicate leadership in technology, innovation or productivity." Even without being a leader in innovation, China does have a way of making the most of its opportunities. For instance, the Chinese have been taking advantage of the vast, empty lands of their northern neighbor Russia. 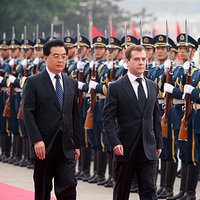 Russia and China signed an agreement in 2009 to allow China to build pipelines through eastern Siberia in order to eventually bring oil and gas into northern China. China has also been importing a great deal of Russian weaponry and has been reverse-engineering the technology so that the Chinese could potentially reproduce the same high tech weapons on their own. In the end, China may gain a great deal more from Russia than Russia is gaining from China. Despite its growth in other areas, China's human rights abuses continue. The Communist government's need to maintain oppressive control over its citizens can still cause the country trouble. Google recently criticized China after China-based hackers broke in and accessed the Gmail accounts of several human rights activists. Google has threatened to pull out of the country after suffering this "highly sophisticated and targeted attack on our corporate infrastructure originating from China" which resulted in "the theft of intellectual property." China is home to 338 million Internet users – nothing to sniff at – and it would be a major irritation for China if Google pulled out. Google's chief legal officer, David Drummond, wrote that the company would no longer censor its results on Google's China Web site, saying, "We recognize that this may well mean having to shut down Google.cn, and potentially our offices in China." If Google walks away, it will make a major statement by a high profile company about what they will and will not deal with - a slap in the face of the Chinese government. Taking their business out of China would mean leaving behind a massive – and growing - market. But, it's good to remind the Chinese government that market-size isn't everything.